We believe that our students love to learn and thrive when challenged. In order to challenge them, our faculty spends time getting to know our students not only as learners, but as individuals. Our teachers are able to identify students’ academic strengths and areas for growth as well as their passions and interests, with precision, and use this understanding to individualize the learning experience. In pursuit of a deeper understanding of our students and their craft, our teachers develop and upgrade their techniques, tools and approaches, frequently, to engage students in meaningful learning experiences. Believing that everyone has the potential for growth, the challenges students and teachers take up enables them to learn about themselves and their role in the world around them. Our premiere team includes smart classroom and subject area teachers, teaching assistants, Literary and Math specialists, Academic Support specialists and school counselor.The School is creates an environment where everyone is able to constantly pursue professional growth and personal development. As a professional learning center, we build global communities for learners and researchers to facilitate the sharing of data, content, tools, and ideas with participation from faculties and schools around the world. 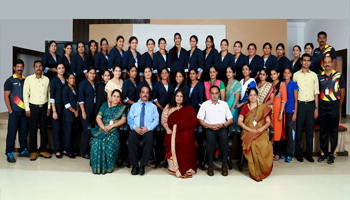 Through conferences, partnerships with universities, peer-led and expert-led workshops, online courses and certificate program, our teachers are able to pursue passions and interests, individualize student learning, and improve their ability to manage the delicate balance between learning content and learning skills among the student community.